Martha came by and gave her a shot of Banamine for the pain. We aren't going to give her Bute or Gastro-Guard orally any more. We suspect the bitter taste is ruining her appetite. Dr. Ruggles from Rood & Riddle also suggested more probiotics... so we gave her some of that too. I was able to get her to eat two apples, two carrots, 1/2 a scoop of grain, and one peppermint. Sounds like a lot, but considering she usually eats 8 scoops of grain plus lots of hay each day, it's really not all that much. I've been out with her in the barn all day. I try to distract her by grooming her and just looking into her deep eyes and talking to her. I stand so close to her, and when I hug her, she rests her whole head and neck over my shoulder. Today she felt twice as heavy as she usually does. I know it is heartbreaking to be you right now, just please remember what you have given and are still giving her. So very many horses are never so lucky to have someone like you and your family go above and beyond for them. Our thoughts are with you, Willow and your family. Hang in there sweet Willow! Oh Shana I am praying for you girls. Wish I was there to help. Keep your chin up, don't get disheartened she needs you. Animals are so strong...its just so tough to watch. Praying, praying, praying for you and Willow!!! Is she colicking? I know she has a ton of issues, but this behavior is sounding like typical colic behavior. Could she be having a gas colic or an impaction colic? Is the vet coming to check her? She could need fluids or some other kind of treatment? So scary. Praying! Oh Shana, My heart is breaking for you both. You are doing everything you can for her, and I know she feels your love surrounding her. Before my boys developed insulin resistance, they loved whole grain cereal for a treat, like the stuff in the "healthy" aisle. Some of the Kashi blends. If the vet said it would be ok, if it wouldn't be more prone to choke her, maybe she'd like something like that. Sending prayers and blessings and a visualization of a "blanket of love and healing" settling over dear sweet Willow. Oh no...this is so very sad! Too bad you can't give her ice cream. Hopefully they can give you other ideas of things she can eat that aren't her usual diet but that she might really love! Oh no. I am praying that she is eating now. I am so sad. This photo makes me extremely sad... so surprised to read this update on Willow. I pray this is just a little rough patch in the road and she turns around quickly and feels better! Keep pushing those negative thoughts out of your head. Demand and have faith that Willow will be healed - picture what you want for Willow and believe it! Oh my heart hurts right now. she knows you are doing everything possible for her. She feels the love you have for her and you have to be strong for her. please keep us posted Shana. Take comfort in the fact that so many are rooting for Willow. Hang in there, you are doing a wonderful job caring for her and getting her the help she needs. Hope she is much better by tomorrow. so very sorry. hang in there and know that you are doing all you can do for her. I will be praying for you and your sweet Willow. Aww, sweet Willow. Hang in there, Shana. She as been through so much. Maybe she needs to just rest. When we rest, our body heals. I have a feeling that she will be fine. She is one lucky horse to have someone to dedicated to her. Please update us when you can...praying for both of you. sending you lots of good energy!! Shana, you and your family (the humans too ;) are so loved by your extended family out here in cyber-space. As hard as this is on us, we know it's a zillion times harder on you. You're not alone, my friend. The prayers and well wishes will never stop! Oooh my heart just hurts and tears in my eyes. I'm praying for you all. Hopefully she just needs a little extra rest. I keep reading about horses lying on their sides like that when they're dehydrated... Is that a possibility? Sending positive, healing thoughts to Willow and to you as well. “Dear Lord, you know what the situation is. I ask that you would touch sweet Willow and begin to heal her. I ask that each day she would become stronger. Lord I am asking that you would strengthen every muscle, tissue and cell in her body. Lord, begin to alleviate the swelling, pain and inflamation. This horse was created by you, Lord. You know how much we love her. But I know that you love her even more. This is your horse Lord. Please heal her. Strengthen her. Touch her in every way. Let her feel surrounded by your comfort, peace and love. Lorraine, that was a beautiful prayer! Could you massage her other legs? Would that help? I'm so worried about her. Sending more prayers for her recovery. Hang in there! Poor Willow, I'm hoping that the fact that she did eat something is a good sign! I'll be thinking about both of you. Praying for that sweet girl! Praying for Willow to get better and for your breaking heart to mend. These are troubled times, yet we must endure. Stand tall for Willow, Shana, and be there for her. That's all she really wants...maybe all she really needs. Ask about previcox instead of the bute. You get the chewable one for the dogs. I used to mix it up with a bit of grain and molassas. We called it crack because my guy couldn't get enough of it. Also, oil is great for weight gain and tummy issues. I pray for you and Willow. I haven't stopped checking in since I found your blog from FB a few weeks ago. As I said before...LOVE, love is what you and Willow have and I know she knows that. And know that while she hurts...she KNOWS that you love her, and all the comfort that you give her instills that more and more in her heart. It's ok to spend the time that you do snuggling...keep that up. At the end of the day...that is SOOO good for both of you!!! you love her like no other Shana and Willow knows that. my heart hurts for both of you. Stay strong. Shana, stay strong! Feel the strength from your friends, family, and cyber friends. We are all sending you strength, and healing thoughts for Willow. Hang in there. Like everybody else has said, my heart hurts for you and Willow. Willow knows that you love her and she knows that you wouldn't do anything to harm her. I wish we could make her better and take her pain away...but while we can't physically do that...we can pray for her. That's what will get Willow and you through this most difficult of times. I had the privilage of laying in a stall with one of these precious creatures a little over a year ago, so I know how you feel and how strong the hurt is. 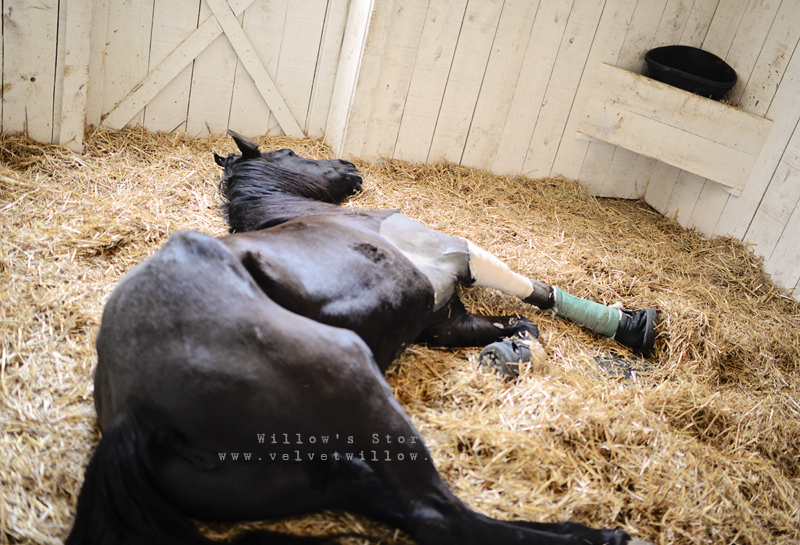 I keep coming back to your blog in hopes that your beautiful Willow is improving. I say prayers every day for you both and will pray extra hard tonight. You have such a big heart and Willow is so lucky to have you caring and loving her! Much love! Oh Shana, I have no words. Sending hugs. You have probably already thought of this, but keep laminitis in mind as a possibility. We have an older horse that foundered, and he also really "went off his feed" as he was confined to his stall for over 2 months. Would soaking feed or hay cubes in warm water entice her to eat? Breaks my heart to see her like this, and I can only imagine how you are feeling right now. I've been following this since I saw the post about her getting hurt on your actions FB page. I have 2 rescue horses myself and I've been touched by your heart and so happy for the love Willow has found in you. When I brought home a gelding nearly 2 years ago he was about 200lbs underweight, full of worms, rainrot, terrible back pain, multiple scars, bad feet and I found out later he had broken, infected teeth. I had to tell my 9 year old son that even if we couldn't get Hobbs healthy that I would know that his last days had been filled with love and gentleness. My son fell in love with him on day 1! I'm also been the "human" for the last 10 years of a mare who had a pretty rough beginning. Every day I am thankful for the lessons these noble animals teach me. Patience, forgiveness, strength, humility.....it's all in there. I so hope Willow recovers and lives a long, happy life. However this journey turns out you have done an amazing thing. God bless Willow, you and all your family and "helpers" on this path. I"m so sorry, I love horses so much and it's hard to even follow this with you. They can break your heart but without them your heart is not full. Hoping she will start eating and feeling better, is there a reason you can't bed her stall really deep so that it is more comfortable if she lays down? We would always make them really deep in shavings and bank the walls so they hopefully wouldn't get cast while they were laying down. Take care of yourself. Praying To All Gods that will hear me ! Please Make Willow Better ! This breaks my heart also. Seeing anyone suffer is awful, but it's so hard to watch an animal we love suffer because they can't tell us what's wrong. I'm so sorry you all have to go through this (I'm including Willow in that). I pray that she feels better quickly and can start to mend. I'm so sorry. Oh Shana... how heartbreaking. Thinking of you both. Lisa C.
Been thinking of you all off and on all day!! Just checking on and still praying!! I have no words. I feel your pain. She has got to get up....eat more. Sending her all my love and pryers. I don't need to know you or Willow, to pray for her. I'm so sad Shana. I'm following, wishing, hoping, praying, crying with you.